Spiced soups, banh mi, summer rolls and noodle salads fly out of the door of this City venue – and prices won’t break the bank. Long before you see this charming little Vietnamese café, you’ll smell some enticing aromas wafting down the street. At lunchtime, you can expect to see a line of City workers at the door; staff are calmly efficient, so don’t baulk at the length of the queue – it disappears in no time. The menu is easy to follow. Choose from lightly spiced noodle soups (bun hue or pho), Vietnamese baguettes (banh mi), vermicelli salads, jasmine rice dishes and spring rolls. Most options are available with beef, pork, chicken or tofu – and there’s a prawn soup. The ‘classic pork’ banh mi comes with a succulent cold cut of pork, earthy liver pâté, fiery chilli, crunchy veg and fresh coriander, all in a light crispy baguette. Vegetarian rice-paper summer rolls, with a hint of lemongrass, are delicate and refreshing. Seating in the bright, modern interior is limited, so City Càphê is not the place for a long and lingering lunch, but it’s perfect for a quick bite or a tasty takeaway. As an Aussie from Sydney, great Vietnamese food was always so easily accessible given our proximity to Asia and is perfect for the hot climate and, protip: Pho is great for hangovers - it’s light on the stomach and full of fresh herbs and spices to get you feeling human again. 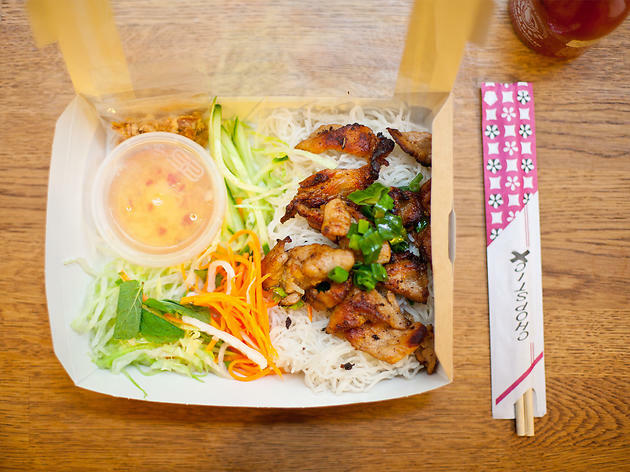 For the day to day grind when you’re constantly at a loss as to what to have for lunch today, Vietnamese is a great go-to as it’s healthy and doesn’t hold back on the flavour. The banh mi here is not bad; with a good filling to bread ratio (technical term); but they are on the smaller side than what I’m used to in Sydney where they have a much longer baguette packed with delicious pork, pâté, coriander and chilli and good ol’ maggi seasoning sauce. So if you’re hungry, I’d supplement this with some summer rolls, which is a serving of two rolls and are served with a hoisin and peanut sauce on the side. The beef pho is okay, (you really just can’t compare it with the Sydney standards) the broth could be punchier but I can understand if they’ve changed it to suit the local palate. The bún here is also fairly good and big in portion sizes; however, I feel that the vermicelli to salad ratio is a little heavier on the vermicelli side; but the betel leaf beef and the chargrilled pork which I’ve also tried before is flavoursome. Overall, a nice go-to for those lunches when you just don’t know what to have but you want something tasty, healthy and that doesn’t break the bank. Tip: go early if you want a seat as they do get very busy during lunch hour. If you’re looking for the bee’s knees for bún, however, and solid pho, don’t forget to try búnbúnbún and Mien Tay, my favourite go-to’s for authentic Vietnamese food. Saints be praised! City Caphe now takes credit cards! No more rushing to get there only to realise you only have pocket lint and 20p in change, resigned to trod to the closest ATM to return to a full queue. No more! I really liked the pho, worth the queue. Fresh and tasty! Managed to miss the lunch time rush by arriving at 2pm so only had to wait a few minutes for my order. Had a Pork bun and was impressed by the portion size - very generous with the meat for the price tag. I even had to leave some of the noodles! The combo with the salad and dressing was delicious - although I'm glad I bought some extra sauce. This is a proper gem for a healthy and authentic lunch in an area saturated with chains! I was incredibly rude staring at people's fried and fresh spring rolls as well - looking forward to going back to try these and the baguettes some time soon! This is an incredibly popular little place, with City workers queuing out the door at busy times, and it is worth the queue. The fresh and flavoursome noodle salads are fab and the banh mi baguettes the best I have found in London so far, not skimping on the meat! (There's nothing worse than a bad meat to baguette ratio). Looking forward to going back and trying out more from their menu! Great service - After a while the lady serving will remember your name and order which is a great touch. The Spicy Beef Noodle Soup is the best I've every tasted. If you love hot food, add in the extra chilli sauce, be careful though because it is hot and I mean hot. The queues say it all. 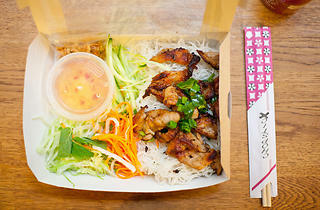 They start at midday and don't calm down until 2pm, lunch hour rush for the best Vietnamese food in the area. No one even minds the queues, it's not deterent as they're quick and the food is worth the wait. Pho is by far the most popular dish in our office - fresh, healthy, authentic - a treat! City Caphe is a hidden gem in the St Pauls/Cheapside area! The queue is pretty long if you hit it in peak time, but it moves fast and the staff are extremely efficient. The food itself is fantastic, with the Pho on par with some of the best I've had in London, and the salads and banh mi full of flavour and fresh ingredients. Definitely worth checking out, and if you want to skip the queues just turn up at 12 or 1.45ish. Worth noting they dont take card unless it's over £15. If you get the pho it's more expensive than normal lunches in the area, but everything else is about average price and more importantly, great value and taste! The vegetarian pho is fantastic, it's become a weekly staple for me. Nothing special - banh mi weren't great, bread was a bit stale and not very substantial. Seafood rolls were only ok.
Lovely food, good place to feed my desire for hot spicy lunches in the city but... I ordered the pho without noodles and the prawn roll expecting the summer roll with prawns, got to my desk and was disappoined to see the classic oily spring rolls in my bag. I went back to complain and was told that there was nothing there could do, was very disappointed espcially as I had just spent a tenner at the City Caphe (which is quite pricey for lunch) and had been spending the same almost daily in the last week. Excellent find. I enjoy the pork vermicelli salad and fresh tofu salad rolls. Just tried the Vietnamese coffee which is served iced and it's delicious, sweet and creamy. I shall be drinking a lot of these this summer. Very busy small cafe with great reasonably priced food. I prefer the rice meals and hot spicy noodle soup, large portions and high quality ingredients. Some unusual drinks on offer, aloe vera is nice. Pay cash and give your initials, they will call when food is ready about 10 mins to queue in lunch rush but worth it. Can't believe I just found this now lunch favorite! Fresh summer rolls so healthy and tasty and huge cups of steaming soup noodles. I love the spicy chicken soup and beef noodle salad but am still working way through menu. A gem in the city compared to Wasabi and Itsu. What a pleasant surprise for finally some good hot food for lunch in th City! I finished a grilled pork banh mi feeling disappointed and my stomach was too! I'm use to banh mi in sydney which is generous and full of flavour. That said the bread is nice and crunchy. The fillings were lacking in quantity and quality and the usual condiments were missing. I'm used to a combination of pate, mayo and a dash of soy sauce. I got the feeling that there was sweet chilli sauce in mine which was unnecessary and did not complement the other items in the bread. When you order they ask for your initials, so be on the lookout otherwise someone with the same initials might take your order. Just tried the classic pork banh mi, the bread roll is very good, but I didn't see any daikon in there which is my favorite, mine only has the carrots, but still it is very tasty. Would definitely want to try other things next time. Shame that city caphe is not close to my work place though.